The only reliable means to define what really matters to the client is to ask. That's stating the obvious. But I could recount numerous situations where the important questions were never asked. Why? In some cases, it was simple neglect. In others, the A/E firm assumed too much (and those assumptions often proved inaccurate). More commonly, I don't think the technical professionals involved knew which questions to ask, or how. A case in point: Several months ago I was helping an engineering firm prepare a proposal for the design of a new wastewater treatment plant. The client, a coastal town in the Southeast, had two small plants and wanted to combine them into one. I asked what seemed an obvious question, "Why is the client doing this?" The two principal engineers I was working with didn't know. They hadn't asked that question in the course of two conversations with the client. "We need to know the answer," I said. "Why does it matter?" responded one of the engineers, "We know what the project is and we know how to do the work." "How can you solve a problem," I replied, "if you don't know why it's a problem?" Think this is an isolated occurrence? I wish it was. I've worked on hundreds of proposals over the years and have consistently asked the why question. More often than not, the answer I've received has been less than satisfactory (although at least most recognize they should know the answer!). And that's just one of several recurring gaps in understanding the client's needs. Plan your meetings with the client. Simple but often ignored advice. When someone convinced me to do this years ago I had considerable sales experience and felt quite comfortable "winging it." But my success in closing sales and satisfying customers increased noticeably when I began planning each client meeting. Not only did I get more from these meetings, but more importantly, the client received more value from the time we spent together. Do we really know what the client expects or how the client feels about each aspect? Do we understand the client's priorities among these issues? Which matter most? Where are we vulnerable in our lack of understanding? Where do the risks lie? Plan your questions in advance. This involves determining both (1) what you want to ask (to close the information gaps identified) and (2) how you want to ask. Concerning the latter, you should have a general sequence of questioning in mind. This is what I call the "Question Progression," which I'll describe in my next post. Explore the three levels of client needs. As noted in my earlier post, we have a tendency to focus on one level--technical needs. Answering the why question relates to the client's strategic needs. You can download a list of strategic needs questions from my website. Personal needs include the expectations relating to the working relationship, which will differ among each client contact. You might find the Client Service Planner helpful in deciding what questions to ask in this regard. 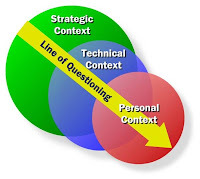 Define the strategic context before delving into technical issues. In other words, start by uncovering strategic needs before jumping into the technical needs that typically attract the bulk of our attention. Knowing the driving forces behind the client's technical issues and concerns enables you to devise better technical solutions. Explore personal needs in depth only after developing a rapport. People vary in how open they are in sharing personal feelings and perspectives. A general rule is to proceed cautiously in asking about such matters, as some will be uncomfortable with the perceived intrusion. It's hard to give specific direction here; you'll have to sense how ready the client is share from the heart. Some get there quickly (in the first meeting), others may take months or never get to that point with you. But don't avoid trying to uncover personal needs, because understanding them can greatly enhance your value proposition. I wonder if ego sometimes gets in the way of listening and asking the right questions. Absolutely, Matt (see the link in the previous post on listening). I think we're all prone to this. Everyone wants to be heard, but so few are really listening. That's what makes it a great opportunity to differentiate yourself with the client. Thanks for the feedback!